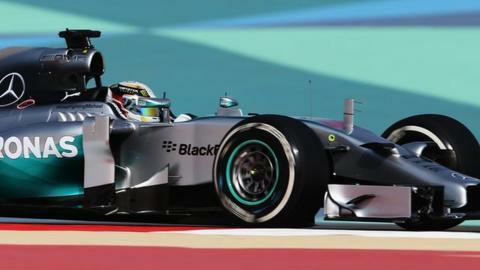 Lewis Hamilton headed Mercedes team-mate Nico Rosberg in first practice at the Bahrain Grand Prix. Hamilton, winner in Malaysia last weekend, was 0.231 seconds clear, with Ferrari's Fernando Alonso third from Force India's Nico Hulkenberg. Jenson Button's McLaren made it four Mercedes-powered cars in the top five, with Ferrari's Kimi Raikkonen sixth. McLaren's Kevin Magnussen, Daniil Kvyat of Toro Rosso, Force India's Sergio Perez and Sebastian Vettel were next. The Mercedes power-unit has a performance advantage over rivals Ferrari and Renault in these early days of new turbo hybrid engines and fuel restrictions. And the comfort with which Hamilton and Rosberg set their times suggested they will be very tough to beat again this weekend after a win apiece for their drivers in the first two races of the season. Alonso by contrast was visibly more on the limit, fighting with adhesion, as he set his best lap, which was fastest at the time, but was soon beaten by Rosberg and then Hamilton. Ferrari had earlier made a mistake in sending the Spaniard out of the garage with mismatched tyres, one 'soft' fitted to the left front amid three mediums. The mistake was noticed before he had gone far down the pit lane and Alonso was pulled back into the garage - the tyres changed before he went out again. Alonso was more than 0.8secs quicker than Raikkonen on laps set at more or less the same time of the session. A number of reserve drivers were given their first race-weekend runs in their cars during the first session. Williams' Felipe Nasr, standing in for Valtteri Bottas, was 13th fastest, 0.5secs behind race driver Felipe Massa. Sauber's Giedo Van Der Garde was 18th, about 0.25secs slower than Adrin Sutil. And Caterham's highly rated Robin Frijns was 0.3secs quicker than race driver Marcus Ericsson. The second session starts at 16:00 BST and will be the first under lights at Bahrain, following the decision to turn the grand prix into a night race this season.